Cooking wild boar might sound intimidating. Perhaps you don’t see it very often, or have never seen, at your local grocery store. In fact, this past weekend was the first time I remember seeing it at our local Wegmans. We had to try it. Wild boar is lean, so you have to be mindful of how you cook it. 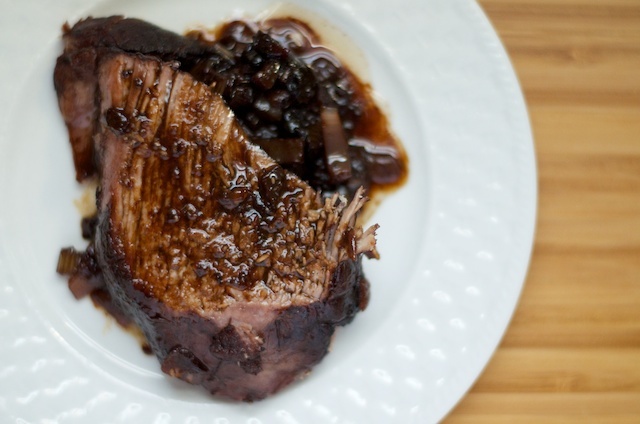 We kept ours moist with a blended red wine that really added a savory element to this otherwise sweet and nutty meat. Cooking wild boar was certainly an experiment, but we think it came out well and we hope you will try it! Melt the coconut oil over medium heat in a large enamel-coated caste-iron pot or dutch oven. Sear the wild boar roast on all 6 sides, about 3 minutes on each side. Set the roast aside and reduce the heat to medium-low. Sauté the onion for 2 to 3 minutes, and scrape up the juices that coat the bottom of the pan from the boar. Then add the celery and continue sautéing for another 2 to 3 minutes. Return the roast to the pot. Add the salt, pepper, oregano, cloves, and bay leaf. Pour in the wine over everything in the pot. Cover and reduce the heat to low. Allow the roast to gently simmer for 90 minutes, flipping it to a new side every 15 minutes until it has cooked on all 6 sides. Allow the boar to rest 5 minutes, and slice. You may top the roast with the caramelized vegetables or plate them with each slice. Either way, you’ll enjoy this preparation of wild boar. So, if you ever come across this less-common cut of meat at the store, we hope you will try cooking wild boar yourself! Any suggestions on where to find good quality Wild Boar? I have a mini roast waiting in my fridge for tomorrow night and I was planning on blogging about it! Great minds think alike!